just a few look to my last wedding with Cloé and Arnould at castle of Pierreclos, in the vineyard of Maconnais, in burgundy. 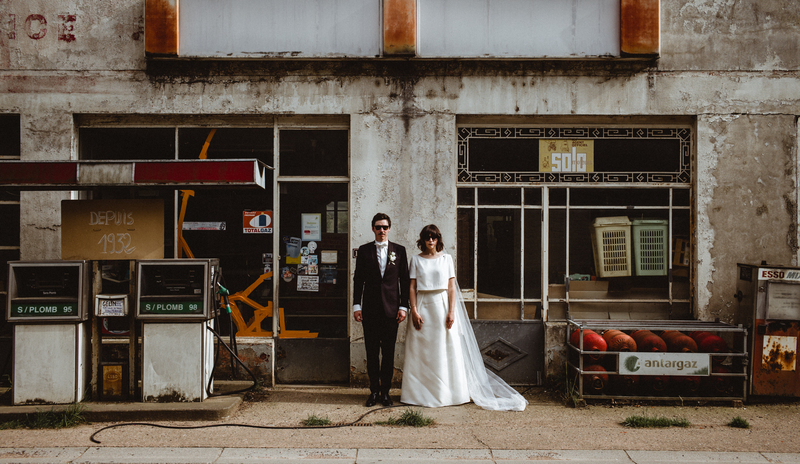 This serie of photographs is a bit special to me because of the couple session that we take in an old gazole station near the castle. We take a sort of “fashion approach” to this session and the result looks pretty fine and fun. Don’t hesitate to tell me about your wedding and wishes, i’ll be happy to cover your D-day. This is to let you know I’m in the May/June edition of top wedding magazine ‘Weddings and Honeymoons Abroad,’ an international magazine based in London aimed at couples looking for their dream wedding venues and honeymoon destinations. In this edition a special section on France focuses particularly on Burgundy and its world-renowned châteaux. I’m featured in an interview and a page of advertising in this prestigious publication, available widely via newsstands, in hotels and at top-class tourist venues. Wishing everyone all the very best, and looking forward to seeing you soon at a wonderful wedding. 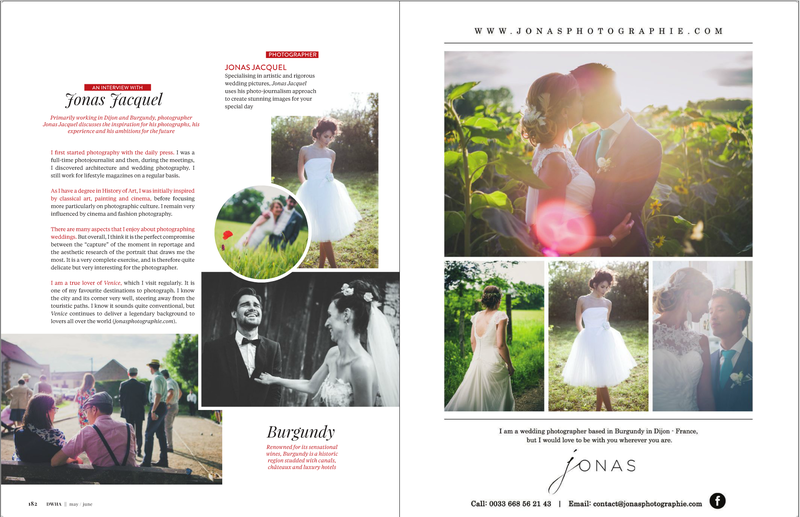 Jonas Jacquel, Wedding Photographer in Dijon, in Burgundy and throughout France. End we’re off again. 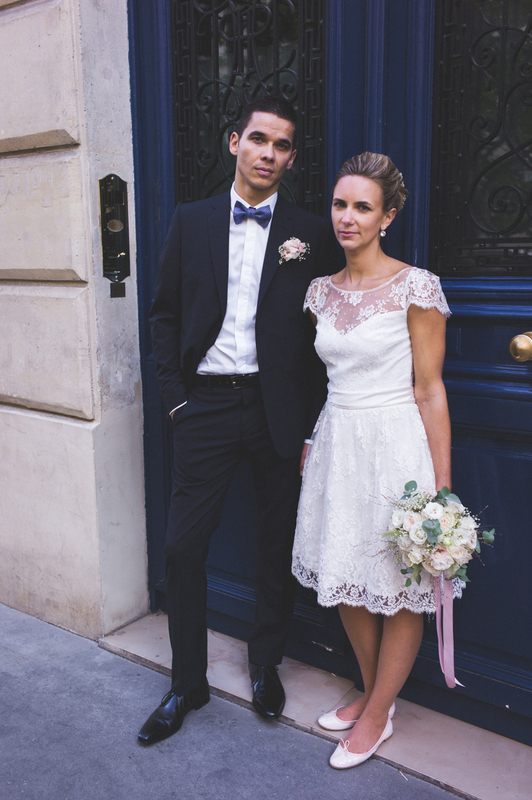 This time for Marion and Pierrick’s little wedding in Paris – and not just anywhere in Paris, but at the famous church of St. Germain-des-Prés if you please! At the town hall in the 6th arrondissement they set the scene by telling you that three (or maybe four – I can’t remember!) of the six presidents of the 5th Republic were married there. OK. Actually, I just took the same photos as usual – but it does make you think, as they say. Fine weather and pleasant surroundings – smart without being ostentatious, a photo with the Eiffel Tower in the background (because you can’t not!) and another one of the happy couple among the flowers in the gardens of the Senate (actually illegal, which is why there’s no-one else in the photo) all result in a photo sequence with very much an urban chic feeling – and very Parisian into the bargain! In actual fact though, city weddings are fairly rare. 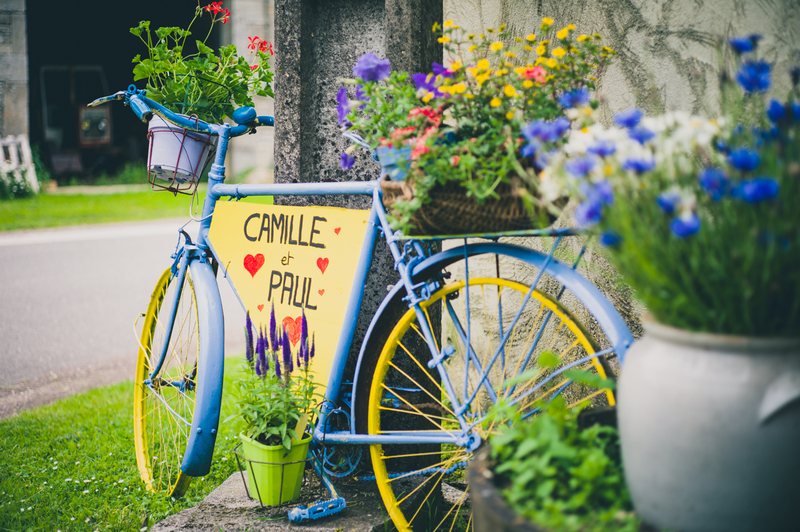 Today I’m sharing a fuller set of wedding photos – those of Paul and Camille, whose wedding was a rural-style, fun occasion near Dijon. Paul is a (very talented!) architect client and his wife is a former colleague of mine from the newspaper world. 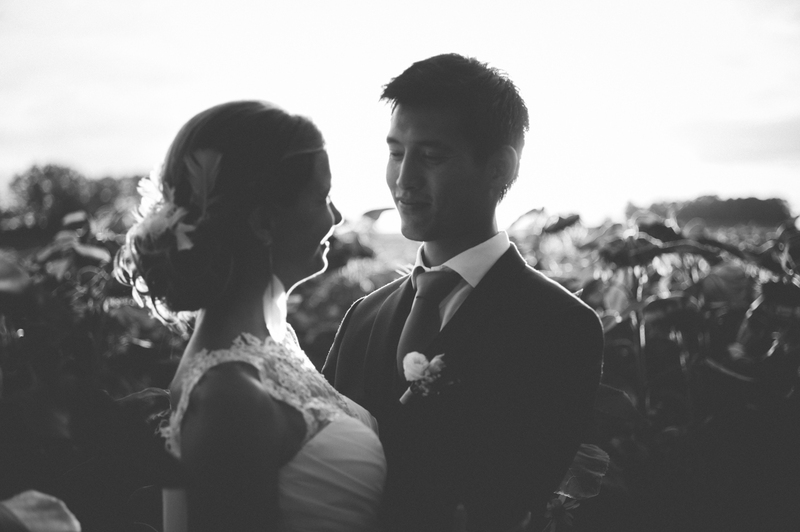 They are now also very good friends and it was a real pleasure to be their wedding photographer. The gathering was organised in a relaxed open-air café style with a 1950s dress code and various games on offer – boules, cup and ball, bowling, together with sweets and even a bouncy castle! The photos capture this wonderfully pleasant and relaxed scene in the square of the village where the bride was born. A van from Foodies provided self-service Burgundy burgers, which really simplified catering arrangements and offered the guests something delightfully different. Conveying the atmosphere of the whole day meant that a natural and elegant style of photography was very definitely called for! The last wedding of the 2016 season was Marie and Dat’s. This was a wonderfully elegant and dignified wedding in the magnificent and somewhat unusual surroundings of GrandMaisons (www.grandmaisons.com) near Paris. I made contact with the bride and groom through the well-known French blog ‘Un Beau Jour’ (‘Special Day’) www.unbeaujour.fr, and the groom already loved the Leica M photos he had seen in my work as a reporter. The great feeling at the start of the day continued right through to the end of it, resulting in very satisfied customers who were delighted with their photos and this record of such a special day.